Michaels et al use sequence mismatches to engineer synthetic miRNA target sites with variable affinity, making a volume knob for adjusting transgene expression. Introducing new genes and regulating their expression is not only a cornerstone of biology research, but is also an essential component of emerging cell- and gene-based therapies. Researchers, this reader included, typically insert transgenes under control of synthetic promoters that drive very high, although variable gene expression. When needed, Tet-based gene expression systems permit inducible expression or repression in response to doxycycline. However, no molecular biology tool offers the function of a volume knob to dial transgene expression levels at will in mammalian cells. Michaels et al reasoned that they could fulfill just such a function by integrating synthetic, user-designed target sites into any transgene, that would be targeted by the cell’s endogenous microRNAs. To make a genetic module for digital control of gene expression, the authors start by using a well known microRNA, miR-17. They then construct a “dictionary” of miR-17 specific miRNA Response Elements (MREs) that bear increasing mismatches to the consensus target sequence. The authors first validate this dictionary in silico and then in cells expressing miR-17 endogenously, using a fluorescence reporter gene. Next, they confirm the system works with a transgene encoding the inhibitory immune receptor PD-1 in Jurkat T-cells (Figure 1). 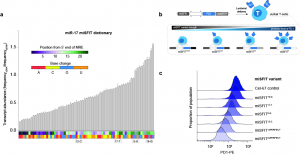 These initial results show that they can select the desired level of gene expression simply by inserting the proper MRE variant downstream of the PD-1 coding sequence. They call this approach microRNA silencing-mediated fine-tuners (miSFITs). In the rest of the paper the authors set about testing functional applications of the miSFIT strategy. They put their idea to the test in a biological context where miSFIT identity dictates antigen expression in a growing tumor. For this, they generate B16-F10 tumor cell lines expressing different levels of a model antigen derived from Ovalbumin (Ova), using miSFIT elements to control Ova expression. Adaptive immunity drives tumor clearance of Ova-expressing, syngeneic tumor cells. As they reduce Ova expression, the authors observe a drop off in tumor cell killing by cytotoxic T cells in vitro, and reduced survival in tumor-bearing mice. Much research has focused on gene regulation through endogenous microRNAs, while experimentally increasing or decreasing the expression of transgenes has relied on synthetic promoters or codon optimization. The present work brings these together for the first time to this reader’s knowledge, in an elegant system with the ability to control gene expression across a wide dynamic range. Beyond dissecting the sequence parameters of miRNA repression at single nucleotide resolution, the authors chose to explore the effects of incrementally decreasing gene expression using an immunogenic tumor model. This represents a pathological context of immense interest to biomedical research. The study of neoantigens – proteins expressed by tumor cells that bear altered amino acid sequences – has dominated tumor immunology1. But far less attention has been paid to the cellular context of neoantigen expression, despite clear evidence that expression levels can determine immune responses2,3. The authors put the miSFIT system to use toward a conceptually simple yet experimentally difficult problem, by tuning expression of Ova on otherwise identical clones of B16 cells. Looking ahead, the miSFIT system merits close attention and development. With this tool in hand, different Ova-expressing clones of B16 cells could perhaps be mixed in defined ratios to assess heterogeneity of antigen expression. This reader also wonders if the results might not be different should a naturally occurring antigen be used, with miSFITs inserted in its endogenous 3’ UTR. Another possibility worth exploring is to reverse the strategy: would exogenously expressed miRNAs with varying affinities target endogenous genes with a linear relation as observed here? Even if the answer is no, integrating miSFITs into transgenes is an easy addition to cloning protocols. Thus, digital control over gene expression might be a regular feature of protocols and in publications before long. A) Effect on gene expression of miSFIT variants. B) Schematic for tuning expression of PD-1. C) Validation of miSFIT strategy for PD-1 expression. See Figure 2 in the original manuscript. Spranger, S. et al. Density of immunogenic antigens does not explain the presence or absence of the T-cell–inflamed tumor microenvironment in melanoma. Proc. Natl. Acad. Sci. 113, E7759–E7768 (2016). Spiotto, M. T. et al. Increasing Tumor Antigen Expression Overcomes “Ignorance” to Solid Tumors via Crosspresentation by Bone Marrow-Derived Stromal Cells. Immunity 17, 737–747 (2002). Kurts, C. et al. CD8 T cell ignorance or tolerance to islet antigens depends on antigen dose. Proc. Natl. Acad. Sci. 96, 12703–12707 (1999). One exciting implication of this technology is that miSFITs could provide a means of tuning endogenous genes. For this purpose however, a few additional considerations will have to be taken into account. Some genes have multiple 3’UTR isoforms so one will have to consider the best place to insert a synthetic miSFIT. Also, some genes may be controlled by auto-regulatory feedback circuits that could counteract or confound the repression imparted by miSFIT. On the other hand, many genes can be knocked down with siRNAs, suggesting they are amenable to artificial post-transcriptional regulation. miSFITs could offer a stable, tuneable and much more specific alternative to siRNA since they respond to a miRNA that is already expressed in the cell. The most interesting thing for me is the huge potential this technology has, both in the clinic and as a research tool: tuning genes to different levels would allow much better control not just of one protein, but potentially several. We went with PD1 because it is so well known – and because it’s not universally thought to be a good idea to simply KO it completely, see for example Odorizzi et al, J Exp Med, 2015. Additionally, because the “genetic footprint” used to control gene expression with misFITs is so small, it doesn’t give raise to worries about edited cells being killed off in an immune-competent host. Katelyn Burleigh, Joanna H. Maltbaek, Stephanie Cambier, et al. Rutger Luteijn, Shivam Zaver, Benjamin G Gowen, et al. Anthony F. Cordova, Christopher Ritchie, Gaelen T. Hess, et al. Jacqueline A Carozza, Volker Boehnert, Kelsey E Shaw, et al. Salah Mahmoudi, Elena Mancini, Alessandra Moore, et al. Themistoklis M. Tsarouchas, Daniel Wehner, Leonardo Cavone, et al. Yuxiao Wang, Walter Huynh, Taylor Skokan, et al. Colin D. Paul, Alexus Devine, Kevin Bishop, et al. Elham Azizi, Ambrose J. Carr, George Plitas, et al. Adair L Borges, Jenny Y Zhang, MaryClare Rollins, et al. Mariann Landsberger, Sylvain Gandon, Sean Meaden, et al.